When we think about security in New York, we think about bolted doors, alarm systems, security cameras and motion sensors. The last thing we would think about is a fireproof door. If you think about it, this is a very important security feature for home or for businesses. A fireproof door is built out of special materials that are resistant to flames and heat. These doors will hold a fire back from entering a room in the event of a fire emergency. Different materials are used and, depending on what material is used, the door can hold off a fire for certain period of time. Usually, this is enough time for emergency services to arrive. When comes down to practicality with security products, fireproof doors seem like a great idea. 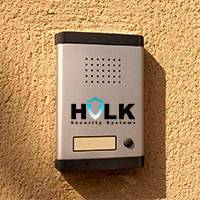 Hulk Security Systems Carries a wide variety of different Security Products, including fireproof doors and other security doors. We offer expert installation of at reasonable prices and all of our products are of the highest quality. Our fireproof doors are built to be the strongest available. This is a fantastic safety feature to include on a child’s room. You can also have fireproof doors installed throughout your home or business. This greatly improves fire safety, which is an important part of good security in New York. Our professional technicians will install and repair fireproofing security products for you so you can rest easily knowing that you have the best quality Security Systems.